Society merchandise may be purchased through the Write Away Chapter Store. Chapter Sponsor login is required. We do not accept returns. All sales are final. We do not accommodate rush processing and shipping through Write Away. Merchandise will be shipped once credit card authorization has been made or check payment has been received. Allow 3 weeks from the time you place your check in the mail for delivery to your location. Let everyone at graduation know about your accomplishments! 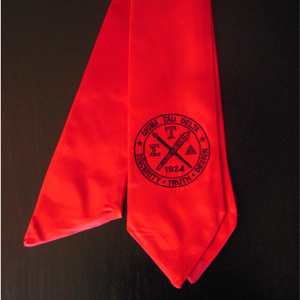 Designed to wear around your neck, our cardinal red honor stole is embroidered in black, with the Sigma Tau Delta seal on the right side. Each satin stole is 60" long, with a 30" drop on each side. 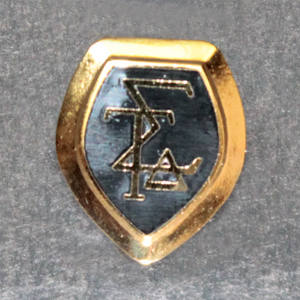 Our 2" antique brass, scalloped round medallion is an impressive replica of Sigma Tau Delta's distinctive Sincerity, Truth, and Design logo. 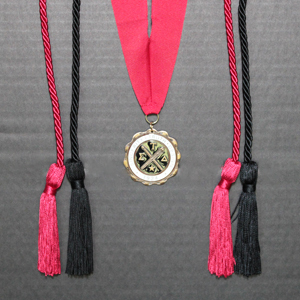 Embellished with three colors (black, red, and white) and a quality 3D appearance, you'll wear this medallion with pride at graduation and other special ceremonies, and display it as a keepsake for years to come. Comes with a 30" x 1-1/2" neck ribbon in cardinal red. 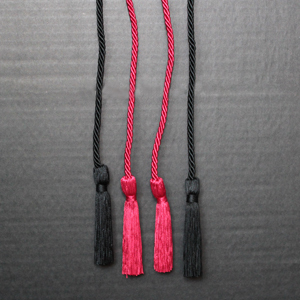 Rich cardinal red and black double strand honor cords (68" long including 4" tassels) display your accomplishments at graduation and provide a lifetime keepsake. Make even more of an impression at graduation wearing a medallion AND honor cords! 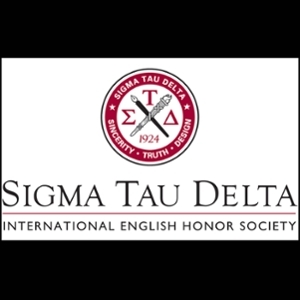 Our 2" antique brass, scalloped round medallion is an impressive replica of Sigma Tau Delta's distinctive Sincerity, Truth, and Design logo. (See complete description above.) Rich cardinal red and black double strand honor cords (68" long including 4" tassels) display your accomplishments and provide a lifetime keepsake. The best of the best! Proudly wear a medallion AND honor stole at graduation. 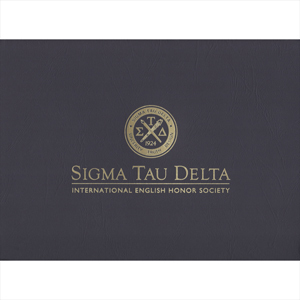 Our 2" antique brass, scalloped round medallion is an impressive replica of Sigma Tau Delta's distinctive Sincerity, Truth, and Design logo. (See complete description above.) 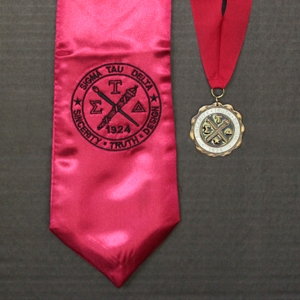 Our cardinal red honor stole is embroidered in black, with the Sigma Tau Delta seal on the right side. Each satin stole is 60" long, with a 30" drop on each side. 1 membership pin is included with membership enrollment; this order is for additional pins. 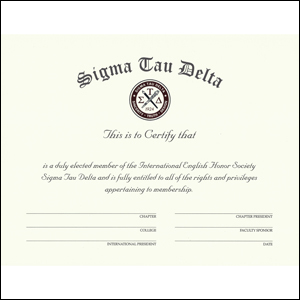 Convey the honor and distinction of membership, as well as preserve your certificate, with this quality 11-1/2" x 8-7/8” black folder with Sigma Tau Delta logo gold foil stamped on the cover. Order 5 certificate folders and save $1.00! 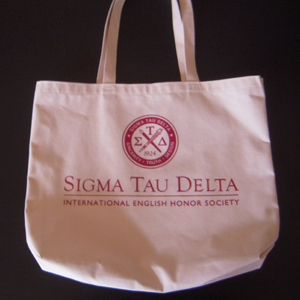 An annual sell-out at convention, our 16" x 14" canvas tote bag with Sigma Tau Delta logo (printed on one side) is an inexpensive and useful way to display your honor society affiliation. 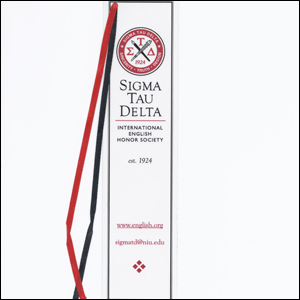 Save your place in a favorite book, and be reminded of fellow book lovers, with our 7" laminated Society bookmark embellished with red and black ribbons. 2-1/2” x 4” sticker; vinyl and waterproof, our new logo sticker is red and black on a white background and adheres to a number of surfaces including glass, metal, and plastic. Great for folders and presentation materials! Order 5 logo stickers and save $1.00! 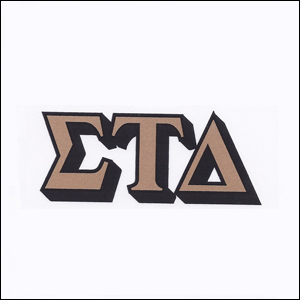 1-1/2" x 3-1/2" decal; mirror image is suitable for placement on the inside of a vehicle window. Order 5 window decals and save $1.00! 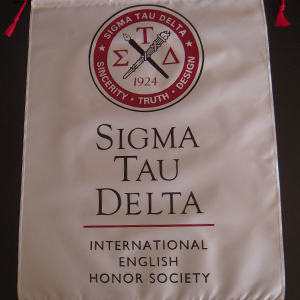 Create a sense of identity with our quality 30"x 22" satin banner with 2" fringe and sewn-in red cord hanger. 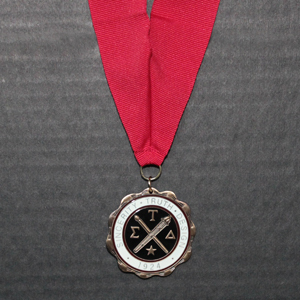 A popular item that is perfect for displaying at events and in your chapter exhibit. 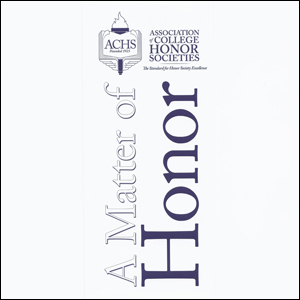 Honor society membership is truly "A Matter of Honor," as indicated in this tri-fold brochure from the Association of College Honor Societies (ACHS). 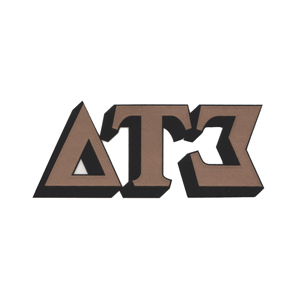 Sigma Tau Delta is one of the largest members of ACHS. 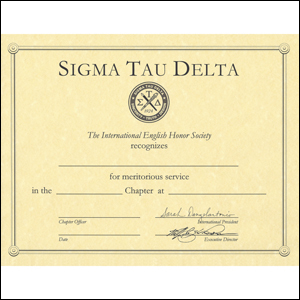 Please include: 1) name as it should appear on replacement certificate; 2) name as it appeared on original certificate; 3) school of induction; 4) year inducted; 5) graduation year. 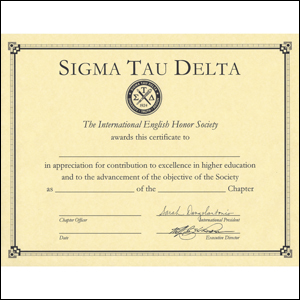 Certificate includes the signatures of Sigma Tau Delta's President and Executive Director.